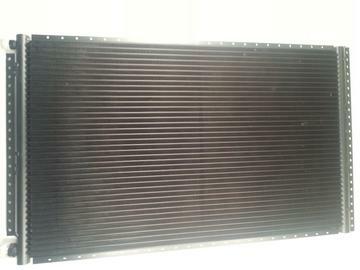 24"W X 14"H Multi Pass Condenser. Replaces Original Serpentine Condenser. 30-40% More Efficient than Serpentine. NOTE: 1-Larger #8 Fitting Is always installed on top. 2-Smaller #6 Fitting is always installed at bottom. #6 Outlet fitting goes to Receiver Dryer . 3-Upon Installation, Always add 1/2-3/4 ounce of PAG 100 to Condenser Before Installation. 6-Some triming may be necessary at corners of Condenser Mounting Flanges for Fit on Some E Bodies and B Bodies. 7-Always mount Condenser as high as possible and as close as possible to radiator support opening.